Early to mid-spring. Little is known about the spawning habits of this species. Males mature in 1 year but often require 2 years, and the female matures in 3 years. The sucker family is widespread throughout North America, but the Roanoke hogsucker has a limited distribution. It occurs only in the Dan River subdrainage of the upper and middle Roanoke River basin, which includes counties in Virginia and North Carolina (Caswell, Stokes and Rockingham counties). 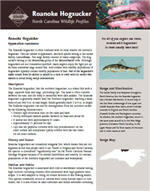 Its relative, the northern hogsucker, occurs in the same areas as well as in the Blue Ridge province of western North Carolina, in the upper Neuse and Tar River basins of the state and in other states as well. 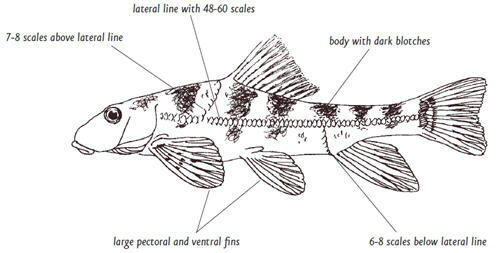 The Roanoke hogsucker is often confused with its close relative the northern hogsucker. They are similar in appearance, and both species belong to the sucker family, Catostomidae. This large family consists of many subgroups. The hogsuckers belong to the Moxostoma group of the Moxostomatini tribe. Although hogsuckers are not considered sportfish, many anglers enjoy the fight put up by these somewhat large stream fish. And streams with healthy populations of hogsuckers typically contain healthy populations of bass. Part of the hogsucker’s name comes from its ability to attach to a rock or shell with its sucker-like mouth to avoid being swept downstream. Lips that are papillose (covered with tiny protuberances) on the outer surface and semiplicate (partly covered with fan-like folds) on the inner surfaces. Roanoke hogsuckers are considered nongame fish, which means they are not regulated as fish that people catch to eat. Native to Virginia and North Carolina, the species is considered “significantly rare” by the North Carolina Natural Heritage Program because of its limited distribution and scarcity. 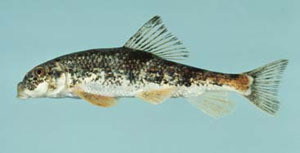 In contrast, populations of the northern hogsucker are common and widespread. 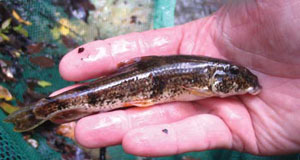 The Roanoke hogsucker is associated with cold-to-warmwater streams having high currents including streams often associated with high-gradient landscapes. It is well-adapted to living on stream bottoms in fast-flowing waters. This species commonly occurs in streams with rocky bottom layers or substrates, but it is also found on sand substrates and mixed substrates including some silt. The Roanoke hogsucker can also be found in riffles, runs and pools, often with overhanging rock ledges or banks. Common food items include aquatic insects (mostly fly larvae) and some algae and detritus—decaying organic matter. Males mature between 1 and 2 years of age, whereas females typically mature and spawn at 2 to 3 years of age. Females apparently live longer, reaching 4 to 5 years; males reach only 3 to 4 years of age. Little is known about this species’ breeding habits but it is known to reproduce during early spring (March through May) in Virginia. Many stream anglers are familiar with hogsuckers. They are well-camouflaged and, when surprised, may dart away and cause anglers to lose footing. Additionally, they may take bait when they run and thus provide a good recreational fishing experience. Protecting water quality and habitat in the Dan River drainage basin is the best way to ensure the stability of the Roanoke hogsucker. Jenkins, R.E., & N.M. Burkhead. Freshwater Fishes of Virginia. 1994. Bethesda, Md. : American Fisheries Society. 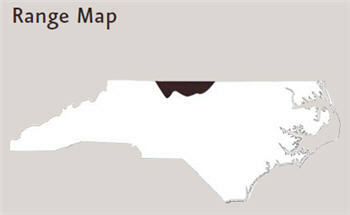 Menhinick, E. F. The Freshwater Fishes of North Carolina. 1991. N.C. Wildlife Resources Commission, Raleigh, N.C.
Rohde, F.C., R.G. Arndt, D.G. Lindquist, & J.F. Parnell. 1994. Freshwater Fishes of the Carolinas, Virginia, Maryland, and Delaware. Chapel Hill, N.C. Illustrated by Duane Raver. Photography by Virginia Department of Game and Inland Fisheries. 14 June 2010 | Fullerton, Aimee H.; Nichols, Robert B.